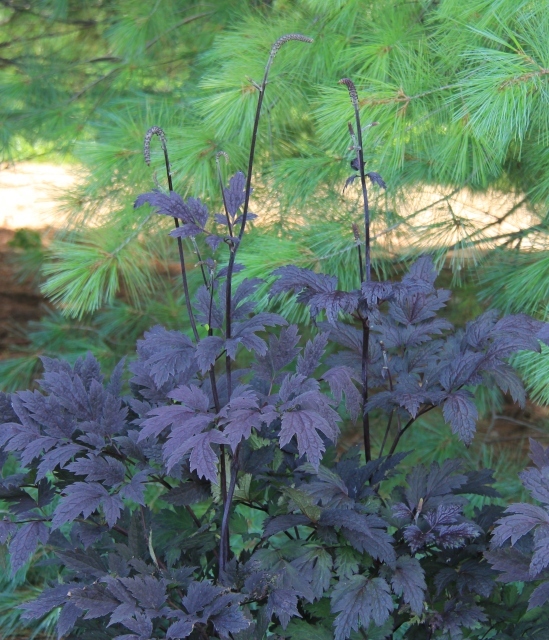 Actea 'Chocoholic is a half size version of 'Hillside Black Beauty' with the same purplish black foliage. The fragrant bottlebrush flowers open mauve pink then lighten to white. They are very attractive to bees, butterflies and many other nectar loving insects. This plant is lovely as an accent in a hosta garden where its striking foliage and finely dissected leaves provide a striking contrast to the coarser leaves of many of the woodland plants. Actea 'Chocoholic' prefers even moisture in partial shade but it will grow in full sun with a constant supply of moisture. It does not like competition from tree roots especially as a young plant. It is shallow rooted and easy to move when it is young so it can be dug up and reset if it is not thriving.